Why study ferns? 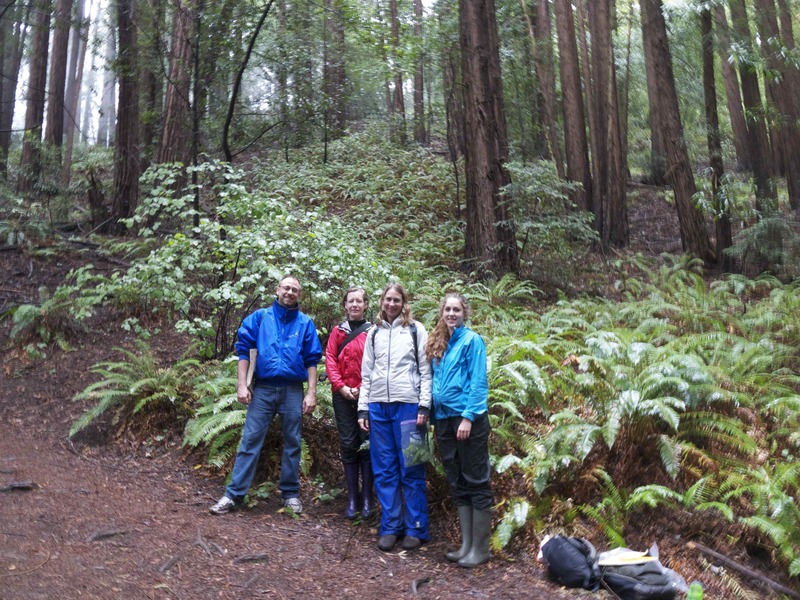 In 2008, I discovered that the height of the most common plant in the coast redwood forest is affected by how much rain and fog fall among the coast redwoods. In wetter forests, like the temperate rainforests of Humboldt and Del Norte Counties,Western sword fern (Polystichum munitum), grows in patches so tall and thick on the forest floor that the ferns are hard to walk through. In drier forests, like the coast redwood forests of Santa Cruz and Monterey Counties, sword ferns grow more sparsely and the fronds on these ferns are shorter. In dry years, sword ferns lose many of their fronds and show signs of stress before other species — like the redwoods themselves — do. For this reason, sword fern is an important indicator of climate change and can help us detect drought in the redwood forest so we can locate areas of climate refuge as the environment continues to change. Fern Watch was formally established in 2012 with the help of fabulous volunteers and is project is making great progress with support from Save the Redwoods League, the Dean Witter Foundation, Chabot Space & Science Center, University of California, Las Positas Community College, East Bay Regional Park, California State Parks, National Park Service, LandPaths and Pepperwood Preserve. 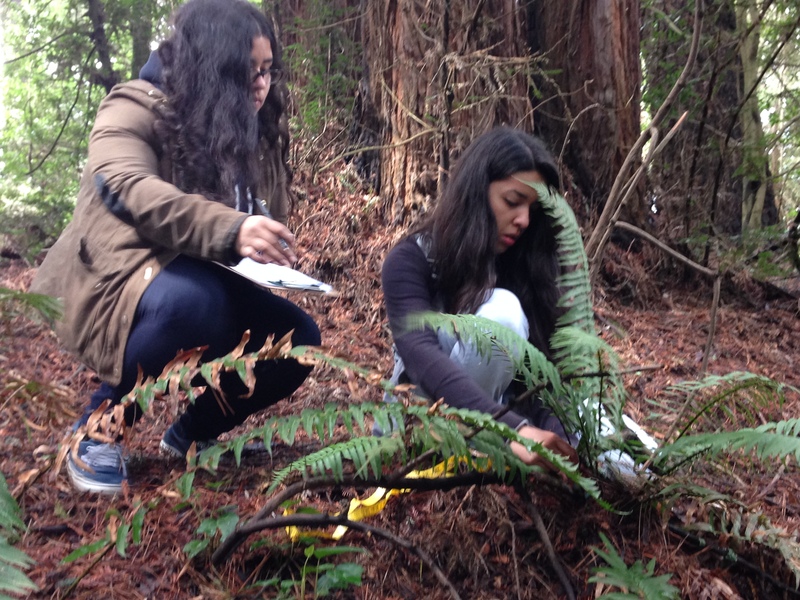 Even the youngest scientists-in-training contribute data every year to this citizen science project that tracks the health of Western sword fern in more than 100 plots scattered across 11 coast redwood forests from the Big Sur coast in the south up through Redwood and National Parks in the north. 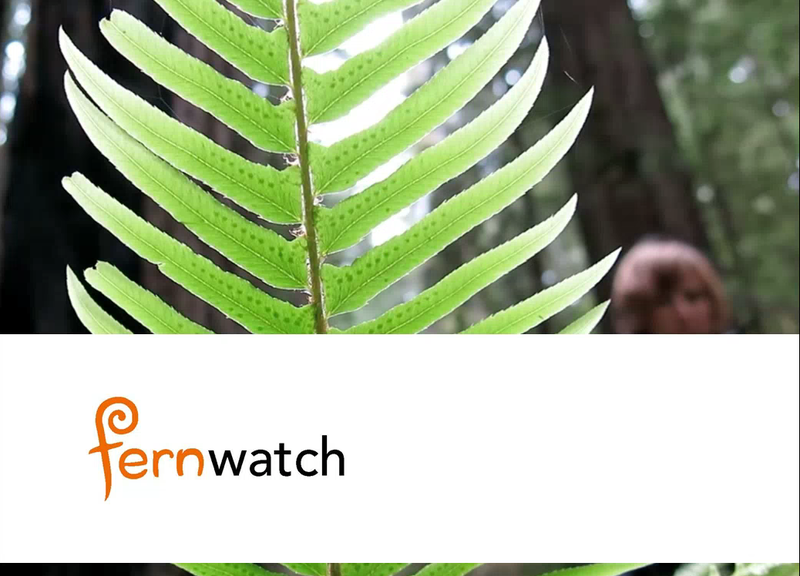 See the distribution of Fern Watch sites here. Fern Watch is powered by amazing volunteers like Eric Havel, Mary Ellen Hannibal, Deborah Zierten, and Cat Morris (left to right). How is drought affecting the ferns? Tracking Western sword fern’s response to weather patterns over the past three years has been especially interesting because the drought has intensified throughout the study. Not only is 2014 turning out to be one of the hottest years on record, but so far is also one of the driest. Consistent with my early research, ferns in the northern end of the range are taller than the ferns in the southern end of the range. As the drought took hold between 2012 and 2013, the average length of the fern fronds in most of the sites decreased. By having smaller fronds, the ferns can conserve more water but that also means that won’t be able to photosynthesize as much. There are lots more data to analyze, but enjoy this first sneak peak below! 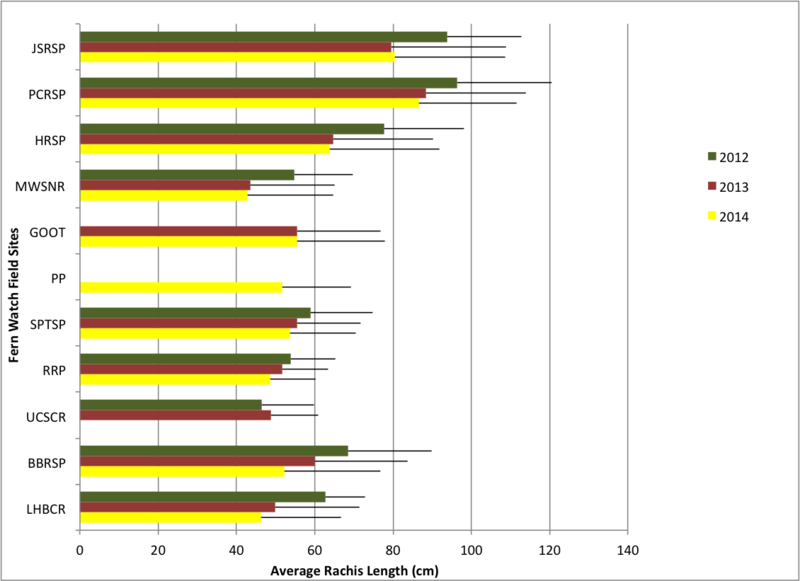 Sword fern frond lengths differ not only between wet forests in the north and dry forests in the south, but also between years (2012 was wetter than either 2013 or 2014). Site abbreviations are Jedediah Smith Redwoods State Park (JSRSP), Prairie Creek Redwoods State Park (PCRSP), Humboldt Redwoods State Park (HRSP), Montgomery Woods State Natural Reserve (MWSNR), Grove of Old Trees (GOOT), Pepperwood Preserve (PP), Samuel P. Taylor State Park (SPTSP), Redwood Regional Park (RRP), University of California, Santa Cruz Reserve (UCSCR), Big Basin Redwoods State Park (BBRSP), Landels-Hill Big Creek Reserve (LHBCR). Site data are pooled plot averages with standard deviations.